Pumps & Accessories Priced at 249.98USD$, submersible, solids-handling waterfall and filter pump (available with flow rates from 1000 to 5200 GPH). Pumps & Accessories AquaForce second-generation asynchronous solids-handling waterfall and pumps accomplish what most other pumps only aspire to accomplish. With the combination of energy-efficient peformance, flow, and ease of maintenance, make this the ideal pump for discriminating pond owners. 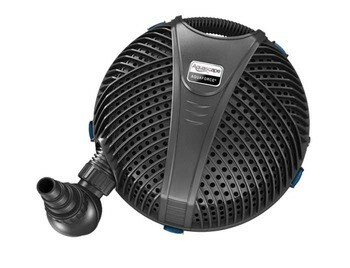 The AquaForce protective pre-filter cage allows the pump to be placed directly into the pond. AquaForce pumps are able to pump solids up to one quarter of an inch, making it ideal for use with external pressure filters or Aquascape waterfalls type filter systems. Extremely energy-efficient, saving hundreds of dollars over traditional water pumps. Asynchronous motor technology provides high levels of torque and trouble-free performance at much higher head heights than the competition. Easy to maintain. 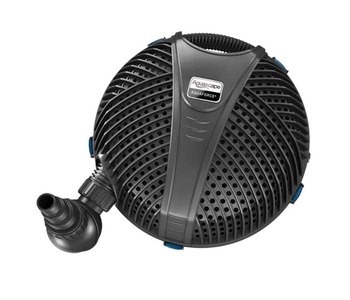 Durable pre-filter cage design prevents clogging and reduces pump maintenance. Oil-free design prevents from any pond contamination. The pump provides years of trouble-free operation. The Aquascape AquaForce 2700 Solids Handling Pumps feature protective pump cage which prevents large debris from clogging or damaging the pumps, thereby reducing any maintenance. Large cage opening allow for solids to be easily processed by the pumps, allowing debris to be passed and filtered, reducing the risk of the pump getting clogged or damaged. Simple pump cage clips make it easy to open the protective pump cage to perform pump maintenance or remove any debris. The wide, flat shape of the pump cage make it stable and easy to place in the pond. 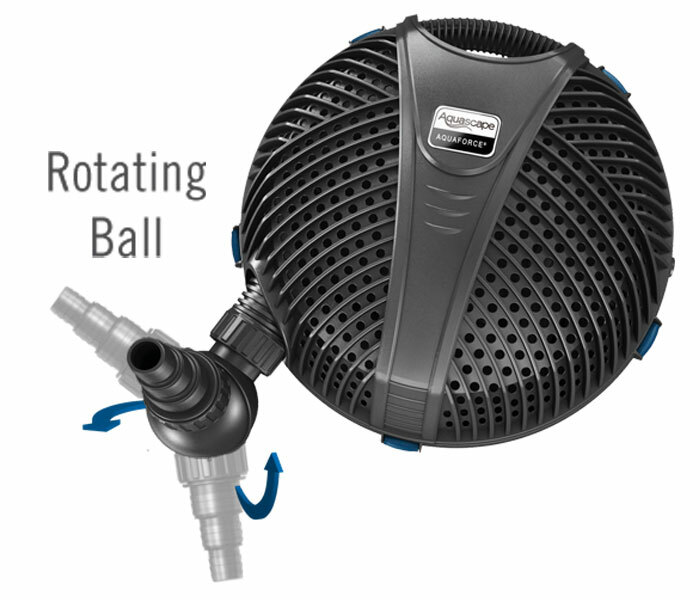 The rational ball output allows the pump discharge position to be easily adjusted, making this pump ideal for all shapes and sizes of the pond. This also allows the pump output to be used as a winterizing pump, preventing the pump from completely freezing over in colder climates. The simple and threaded disconnect allow for the pump to be easily removed from the pond for maintenance. Asynchronous motor technology make this pump much more powerful than the competition. The pump specifications are as follow: The max flow rate is 2695gph. Max head height is 14.1ft. Motor type is asynchronous. The chord length is 25ft. The pump discharge is 3/4””. The weight of the product is 11.5lbs.